Jim MacFarland is a Derryman and is one of Ireland's finest traditional singers. He is also known for his collection of songs from the Irish source singers. 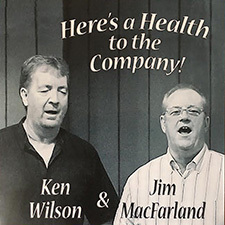 Ken Wilson is from Teesside in the North of England, part of the wonderful Wilson Family but a fine singer in his own right. They have known each other for the past fifteen years or so and have always had a mutual respect for each other's singing. In 2013 they were asked to tour in Ireland and perform their mixture of both Irish and English traditional songs. Since then they have appeared at a number of clubs and festivals in the UK and Ireland.